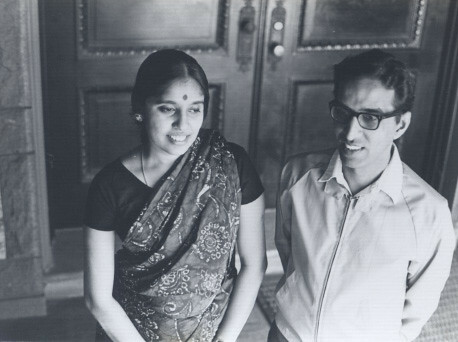 Like the peeling of an onion, the conversation with Ammini (67) & Rama Ramachandran (76) slowly unfolded to reveal fascinating aspects of a life lived together. Originally from Kerala, they have lived in USA since 1970 and have 2 sons. She is a writer and he a Professor of economics. Their passion & dedication to the task at hand is evident as soon as the conversation begins. But what emerged was how his scientific logical mind has played a great role in Ammini’s career. Her book Grains, Greens & Grated coconuts is one of our favourite cookbooks – well planned content, perfect recipes & breath taking insights into the history of Kerala cuisine. On Oct 1, 2011, we had the pleasure of inviting them for dinner, and got to understand what makes her work exemplary – behind this successful woman, stands a strong man! J&P: Before we jump into cookbook conversations from where there is no return, tell us when, where & how the two of you met? Rama : Our families were best friends and as the two of us were growing up, they decided we would marry one day. Ammini: They were 2 boys and we were 3 girls & both of us were the oldest, so his parents always considered me as their daughter and my parents looked upon him as their son. He: From our teens, we knew we were going to be married. She: And it seemed like neither of us had any reason to decide otherwise! J&P: Ah lovely. But do you think such a thing is possible now? Would you decide for your children? She: Things are a lot different now. My father passed away when I was eight, so my mother had just one goal – to get her three daughters married. And all of us accepted that. I had my boys early and by the time I was in mid-thirties, the boys were claiming their independence. He: In USA, and now in India too, you don’t want your parents chaperoning you. Marriage is obviously a personal decision now. Our elder son married a lovely American girl & the younger one is 40 years old and not even thinking of marriage. J&P: So you were not very busy parents? She: Yes & No. In fact, since our boys were always independent, I constantly complained of boredom. And to that, Rama’s reply was: Do something. In fact, if he hadn’t pushed me, I may not have really started working. J&P: Did you move to USA as soon as you were married? 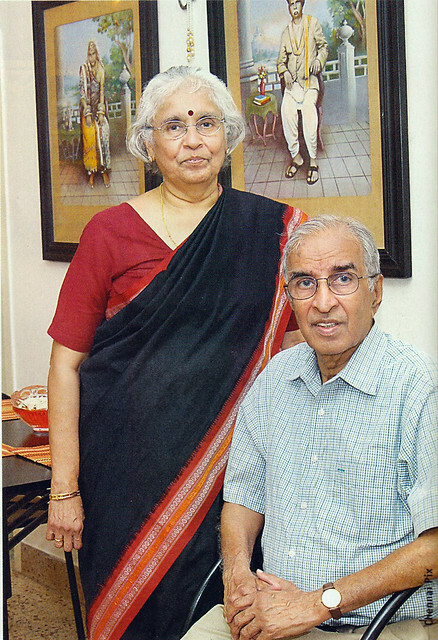 He: We got married in our hometown in Kerala in 1964 & left for USA in 1970 where I wanted to pursue my Ph.d. I had already been abroad for my higher studies & this move was a natural outcome. I became a professor of economics at Southern Methodist University, Dallas for 14 years & then at Business School of New York University for 18 years. J&P: Ammini, how did you start your career? Did you always want to write cookbooks? She: It was boredom that propelled me to think of work. I decided to do an MBA and enrolled in an evening school. Looking back, I wonder how we managed it all! But we did & I worked for 22 years as a financial analyst and later in New York, as senior credit officer in an Italian bank. J&P: How did the book happen? She: I have always been interested in food history & wanted to write about Kerala cuisine. My mother was an excellent cook & hostess. Most of my cousins were abroad and they all remembered her dishes & would talk about them whenever we met. He: She would often write articles about food on her website. It was like her first hobby. She: The New York University had a department of food studies that offered a course on how to write cookbooks. I joined the course and as they say, the rest is history. J&P: Not everyone who writes cookbooks has actually done such a course. This penchant for methodology – is this the USA influence? He: Probably so. Doing things in a structured manner is the right way. She: When I started writing about food, I wrote like a financial analyst. It took a lot of rewriting & finding a good editor. I also became a member of IACP (International Association of Culinary Professionals) where I met some wonderful people who really helped me. J&P: Were you always a good cook? What are your favourites? He: (laughs) When we were in India, we had a cook. But in Rhode Island (where I was doing my Ph.D), we were the only married couple on our campus. So on weekends, many students and friends would come hoping for a home-cooked meal. But she really had no clue. Nor did I. She: And unlike now, in those days, communicating with home was not easy. Trunk calls were expensive. But my mother sent me a letter every week with two recipes. They were written with hand measurements, just like she cooked – with pinches and fistfuls instead of teaspoons. He: And that is what I now enjoy the most in her cooking – her mother’s touch! The Ellukari, chutney with friend banana chips, Wadas, Appams, & of course, her dosas are much sought after by all our friends. She: I also learnt to cook from magazines. I remember looking at a recipe contest in one of them. On an impulse, I borrowed a friend’s typewriter & typed my mother’s coconut rice recipe tweaking it with American measurements. It won the first prize – that was in 1973. It excited me no end. I also enjoy cooking Italian, Mexican & French cuisines. J&P: In a nutshell, tell us what you really admire about each other. He: She had to go through many transformations to reach where she is today, and I admire the way she did that. She: It was his motivation that made me do most of the things I did. J&P: What is it you would like to change in the other? He: Our time schedules! They never match. She: Yes, if we have to something early in the morning, it is tough. He wakes up late & starts the day only after his three cups of coffee & two newspapers. He: We have 2 office rooms – she sits in hers facing east & I sit in mine facing west. I am a night person & can work late. She switches off after dinner. She: After a while, you simply adjust. J&P: Is that your advice for the present generation? She: This generation is very different. In many Indian families, parents pressurize their children to agree to an arranged marriage. But often, in such a situation, they marry without understanding commitment. He: We always tell our children to be honest & to trust each other. She: The Indian family structure is changing, becoming more nuclear & independent. Yet the good thing is that youngsters seem to have more honest & happy relationships. He: In life, one must learn to change & adjust to changes in each other. Photo courtesy : Pic 1 from Harmony Magazine, Pic 2 sent by Ammini. First published in November 2011 in Harmony – the magazine for senior citizens for the column – Soul Food and Soul Mates. Part-2 of this post is the Kerala recipe Kurukku Kaalan from the kitchen of Ammini & Rama Ramachandran – the 5th couple featured in this column.